As the demand for Connection Design as part of a Detailing package increases, PSDESIGN answers the call by employing a team of highly qualified engineers – licensed in multiple states. PSDESIGN utilizes DesconBrace, DesconWin, Design Data’s SDS/2, and In House MathCAD sheets for designing connections. Projects are created in one Master 3D model utilized for additions and corrections (per the EOR) through completion of the project. PSDESIGN provides steel connection design services for engineering firms and steel fabricators, delivering professional engineered stamped connection details and shop drawings. Our present connection design capacities are +5,000 tons of steel each month through five (5) offices. Non Seismic and Seismic: registered Structural Engineer (SE) performs steel connection design in a high seismic zone. 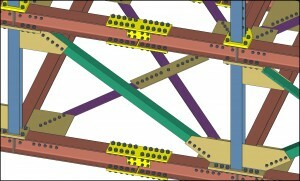 Special Structure Connections: moment connection, column and beam splice, high axial, wind, and seismic loaded structure connection design. Miscellaneous Connections: accurate 3D modeling of ladders, stairs and handrail. Engineer Review & Shop Drawings: review shop drawings, evaluate connection capacities and provide professional engineering seal.